Al Ayre Español was founded in 1988 by Eduardo López Banzo, in an effort to challenge the pervading clichés that often surrounded the performance of Spanish baroque music at that time. The name of the ensemble was inspired by the title of a guitar fugue by the Aragonese composer Gaspar Sanz. 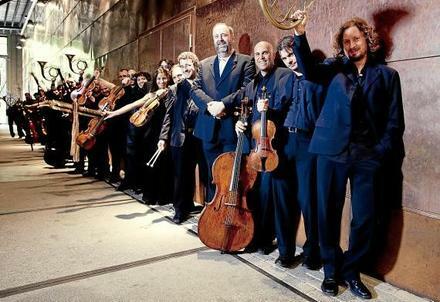 The fact that Al Ayre Español has not settled for becoming a specialised early music ensemble, but chosen instead to create a musical philosophy "al ayre español" (à la espagnole), has allowed the project to be flexible enough to adapt itself to different formats; as a baroque orchestra –internationally acclaimed by its performances of Handel and Bach- and lately, as a classical-romantic orchestra -with opera and concert performances of Haydn and Mozart. With over 25 years of appearances in the top festivals and theaters in Europe, 10 years as a resident orchestra at the Auditorio de Zaragoza, 18 CD recordings, national and international awards (2004 Premio Nacional de Música, among others) and distinctions (Ambassador of Zaragoza since 2011), as well as a relentless schedule of international performances and events for the coming seasons, there is no doubt that the group from Aragon is one of the most prominent ensembles in Spain. Throughout this quarter of a century Al Ayre Español has performed at the most prestigious concert halls: Amsterdam's Concertgebouw, Vienna's Musikverein and Konzerthaus, Düsseldorf's Tonhalle, Berlin's Konzerthaus and Philharmonie, the Théatre des Champs Elysées and the Cité de la Musique in Paris, Madrid's Teatro Real and Auditorio Nacional, Barcelona's Palau de la Musica Catalana and Gran Teatre del Liceu, Hamburg's Leiszhalle, Washington's Library of Congress, the Palais des Beaux Arts in Brussels, Metz's Arsenal, Lisbon's Fundação Calouste Gulbenkian, Bilbao's Palacio Euskalduna, Rome's Teatro Olimpico, etc. Al Ayre Español has also been invited to some of the most important festivals: Baden Baden Easter Festival, Bachstpiele Leipzig, Oude Muziek Utrecht, Internationale Festtage Alter Musik Stuttgart, Schleswig-Holstein Musik Festival, Dresdner Musikfestpiele, Festival d'Ambronay, Handel Festspiele Halle, Oslo Church Music Festival, Praga Spring Festival etc. Al Ayre Español’s recordings have been produced by labels such as Almaviva, Fidelio, Deutsche Harmonia Mundi, Harmonia Mundi, Naïve-Ambroisie and Challenge Records. In 2015, the ensemble released its latest CD, “To all lovers of Musick”, featuring the complete op. 5 of G.F. Handel, on the Dutch label Challenge Records. Al Ayre Español is sponsored by the Gobierno de Aragón (Aragonese government), Axial Wines, Ibercaja Bank, Industrias Químicas del Ebro and the Ministry of Culture of Spain, and maintains a residence agreement with the Auditorio de Zaragoza. The ensemble has been Zaragoza’s ambassador since 2011.